HDMI-CEC standard: What is a HDMI CEC standard? Control your TV, DVD, AV Receiver and even your computer/laptop with just one remote control! 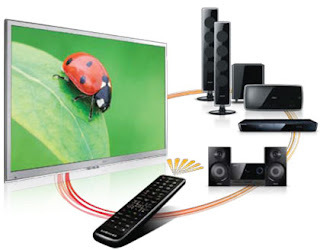 Isn't it cool to control your computer (for example HTPC) with your TV's or AV receiver's remote control? What is a HDMI CEC standard? HDMI (High-Definition Multimedia Interface) is an audio/video interface for transferring uncompressed digital audio/video data between two or more HDMI-compliant devices (like audio devices such as AV receivers or mini Hi-Fi systems, or video devices such as TV's, monitors, projectors, desktop computers or notebooks). Most new TV's, graphic cards and notebooks come with a HDMI jack. There's no need for signal conversion since HDMI is electrically compatible with the CEA-861 signals used by DVI (Digital Visual Interface). You can also use a DVI to HDMI adapter without loss of video quality. There are three physically separate communication channels in HDMI; DDC, TMDS and the optional CEC, and ARC and HEC in HDMI 1.4. So, what is a HDMI CEC? CEC stands for Consumer Electronics Control which allows HDMI devices to control each other. Furthermore, it allows user to operate multiple devices with just one remote control. It is possible to command and control up-to ten CEC-enabled devices, that are connected through HDMI. For example, you can use your TV's remote control to control TV, computer (HTPC for example), DVD, AV Receiver and other. CEC-enabled devices can also command and control each other without user intervention, for example, when you power off your TV, it can power off other components, or if you power off your computer/netbook, it can power off your TV if it's connected through HDMI. HDMI-CEC use a one-wire bidirectional sserial bus that uses the AV.link protocol to perform remote control functions. Implementation of CEC in a product is optional but CEC wiring is mandatory. You probably have some HDMI devices with HDMI since you're reading this article, so you want to start using HDMI CEC, right? First you need to now if your devices are in compliance with the HDMI-CEC standard. >> How to see if your device support HDMI-CEC standard? Great post. My husband just bought a new tv and surround sound. Now we have 4 different remotes and it is driving me crazy. I will have to send this post to my husband, thanks so much for sharing. Myteriosly turns my tv back on. A must to read information. Thanks a lot. It's truly awesome and I like to read this type of impressing article. So I like to thank you for sharing a great article. What is a HDMI-CEC standard?